Oct. 10, 2017 — San Diego and Cape Town, South Africa— Edico Genome and the Centre for Proteomic and Genomic Research (CPGR) today announced the deployment of the first DRAGENTM Bio-IT platform in Africa. Selected by CPGR to help drive adoption of precision medicine and genomics, DRAGEN will be made available to life science and biotech communities in South Africa. The DRAGEN card is integrated into a scalable and flexible 2U Dell EMC PowerEdge R730 server. CPGR is a non-profit organization dedicated to providing state-of-the-art ‘omics’ services to South Africa’s life sciences and biotech communities, originating from an initiative by the South Africa Department of Science and Technology(DST). CPGR combines innovative, information-rich genomic and proteomic technologies with bio-computational pipelines to develop customized offerings for users in both academia and industry. CPGR hosts a suite of genomics and proteomics platforms that allow for the design and execution of projects using single or multiple ‘omics’ methodologies, with the goal of generating targeted and systems biological insights. CPGR will utilize DRAGEN to help advance the development of next-generation sequencing (NGS) applications and data analysis pipelines. 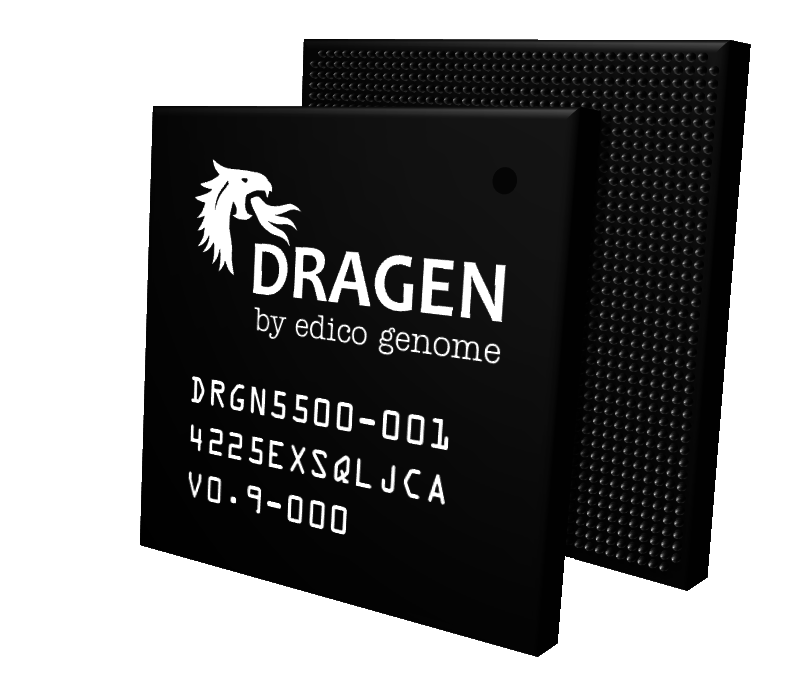 DRAGEN is highly reconfigurable, using a field-programmable gate array (FPGA) to provide hardware-accelerated implementations of genome pipeline algorithms, such as BCL conversion, compression, mapping, alignment, sorting, duplicate marking and haplotype variant calling. The platform supports whole genomes, exomes and targeted panels, and includes comprehensive pipelines for Germline, Somatic, RNA, Methylation and Population Calling analysis. By implementing algorithms as logic circuits which can be massively parallelized, DRAGEN is able to deliver best-in-class performance, reducing the time needed to analyze a whole human genome at 30x coverage from 20 to 30 hours using traditional software-based algorithms (BWA-GATK) to approximately 20 minutes. CPGR is the latest addition to DRAGEN’s global customer base, which includes Rady Children’s Institute for Genomic Medicine, Baylor Genetics, the National Human Genome Research Institute (NHGRI) and National Cancer Institute (NCI) and others. The Centre for Proteomic and Genomic Research (CPGR) is one of Africa’s first fully integrated ‘omics’ service providers, built to leapfrog South Africa’s ability to conduct information-rich biomedical research onto a globally competitive level. Amongst others, the organization offers the following ‘omics’ capacity: Next-Generation Sequencing: NextSeq500 (1x), MiSeq (1x), MiniSeq (1x), IonTorrent PGM (2x), IonProton (1x), for sequencing projects; Microarrays: Affymetrix GS 3000 and Affymetrix GeneTitan for genotyping and gene-expression analysis; Mass spectrometry: ABI 4800 MALDI-ToF/ToF; Waters Xevo TQS triple quadrupole, SCIEX API4000 triple quadrupole and Thermo Q Exactive for MS-Proteomics; High-throughput PCR: QuantStudio 12K Flex Real-Time PCR System, QuantStudio 3D Digital PCR System and ABI 7900 for qRT-PCR and genotyping applications; Automated DNA/RNA QC, library handling and sample processing; dedicated IT infrastructure and bioinformatic applications for data analysis and interpretation. The use of next-generation sequencing is growing at an unprecedented pace, creating a need for easy to implement infrastructure that enables rapid, accurate and cost-effective processing and storage of this big data. Edico Genome has created a patented end-to-end platform solution for analysis of next-generation sequencing data, DRAGEN™, which speeds whole genome data analysis from hours to minutes while maintaining high accuracy and reducing costs. Top clinicians and researchers are utilizing the platform to achieve faster diagnoses for critically ill newborns, cancer patients and expecting parents waiting on prenatal tests, and faster results for scientists and drug developers. For more information, visit www.EdicoGenome.com or follow @EdicoGenome.